Well we are up to a fabulous number eleven in the Ruth Galloway series and to my mind the split between investigation and catching up with some, by now, much-loved characters makes for the perfect read. First to the mystery at the heart of The Stone Circle and I’m glad to say the brief foray to foreign lands of the last novel is over and we are back in Norfolk once again. Not that I have anything against other places but Ruth and Harry Nelson really do belong at home. That means that Dr Ruth Galloway is at the university and ready and waiting to oversee an archaeological dig at a henge, or stone circle. Within the henge, bones are found and more modern than the bronze age structure would account for. And then Suddenly it is as if the clock has turned right back to the first case that Ruth assisted DCI Nelson with, The Crossing Places. At the end of the book Elly Griffiths states that the idea was that there would be ten books in the Ruth Galloway series so perhaps it is fitting that there are many echoes in this book of the very first one – in fact so much so I was tempted to go back and re-read The Crossing Place. But I rarely go back and somehow I think I would be tempted to read my way back through and I simply don’t have enough spare time to re-read all ten books – well not until I am put on that desert island with my kindle! Anyway without the plot which mirrors that early case with a young girl’s body being found and a cold case being reviewed with all the resultant wounds that opens, and hopefully heals, we also have DCI Nelson receiving some disturbing letters. Now I don’t know about you but if I was choosing to send someone anonymous letters, I doubt that I’d choose a policeman, but hey there’s none so queer as folk! This series as a whole, and this book in particular, also addresses the somewhat shocking aspects of what has come before. Elly Griffiths keeps a grip of her characters so it isn’t only the big events that she ensures continue as a thread but some of the more minor events also . I’m a bit of a nerd in this respect so give a little smile when I spot an event being played forward in a later book. 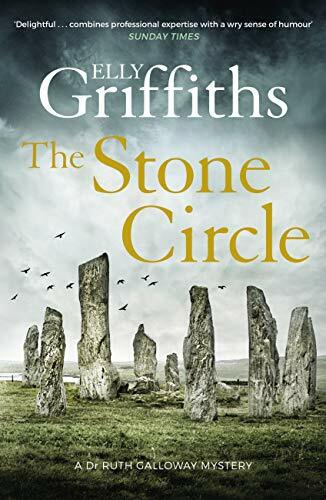 So as always for this series it is a resounding recommendation from me and a huge amount of gratitude to the publishers Quercus who allowed me to read an advance copy of The Stone Circle before the publication day of, today! New author new book for me. Thank you for the review. Worst part for me is the new book doesn’t come out in America till May! Oh dear. This sounds wonderful. I am so sadly behind with this series. I read the first three books and loved them a lot. Then, with other reading commitments I put it on the ‘back burner’ and never got back to it. It sounds like a fabulous addition to the series, Cleo. This is a top series, too, isn’t it? Griffiths does such an effective job creating depth in her characters, and that’s not to mention her way with setting! Cleo, I am so pleased that you liked this one so much! I did as well. I loved catching up with everyone, but also the story taking us back to the beginning in some ways. I agree with all you said and, no, I don’t want Ruth to leave the area. As to rereading – well, that’s what I use audiobooks for at times…just saying…ha! I enjoyed The Crossing Places, and wanted to keep going with the series, as I really like the Ruth Galloway character. Thanks for tempting me to go further. There’s nothing better than returning to a series you love. For me, it’s Alan Bradley’s Flavia de Luce series! I love her, and the cast of characters she comes with. Wonderful review. It really says something about this series that you would love to have time to go back and reread all of them.